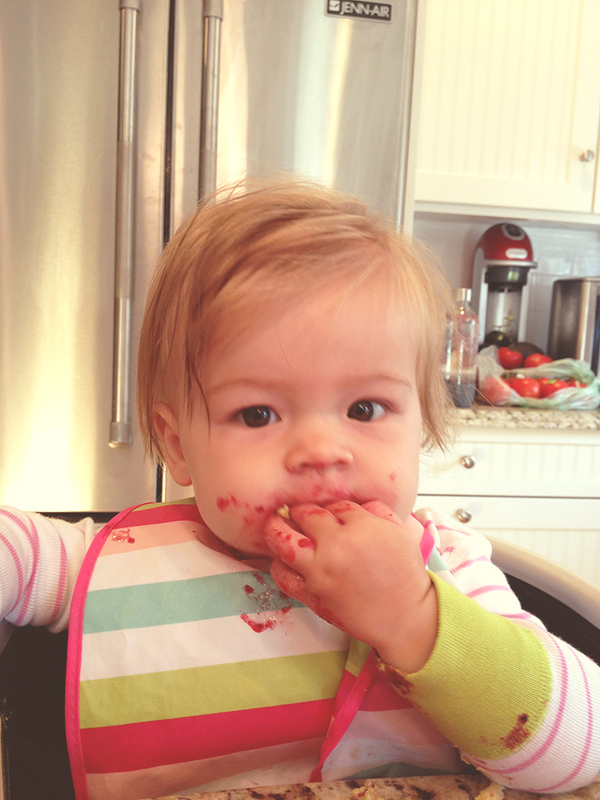 No need for a spoon when you have these little fingers for scooping! It’s been awhile since I’ve written about our changes in our daily schedule, which includes updates on solids, breastfeeding + the bottle. I feel like I’ve spent endless hours googling sample schedules at each new phase of Ellery’s development. 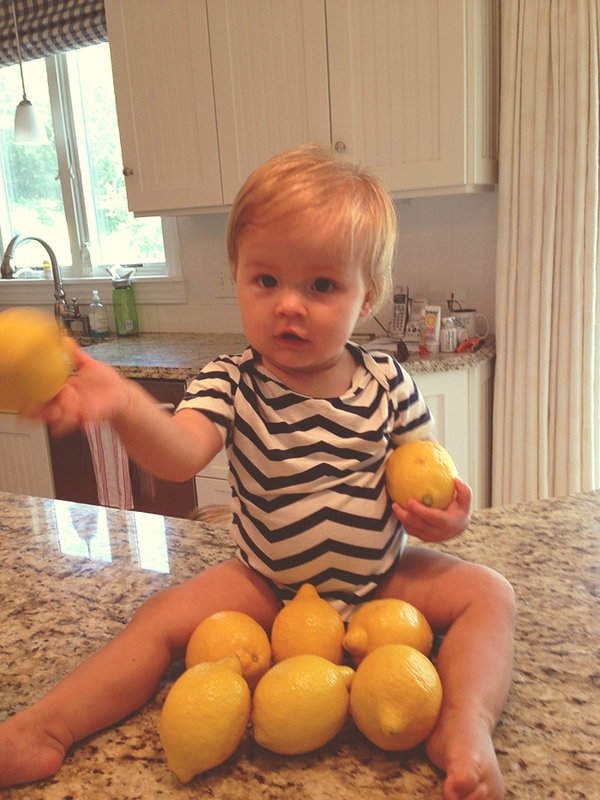 It’s hard as a new Mom (and new Dad) to know how much your baby should be eating, how often and what types of foods. It can be overwhelming and confusing. Every book, website, etc…has a different suggestion. 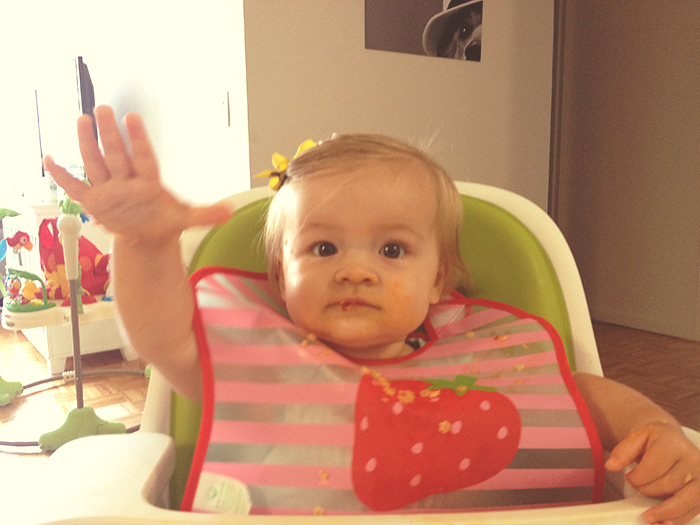 So, here is how we’ve been doing things and the changes we’ve made since first introducing solids. I truly feel like we are in a great rhythm AND have a great little eater on our hands due to making a few small adjustments to our daily routine. I highly recommend talking to your Pediatrician before making any sudden changes or adjustments as every baby is different but I do know it sometimes helps to see what other people are doing to get an idea of how to “create your day”. 6:30 am: Upon waking, she nurses in bed with me. Then we get up and I make her breakfast (solids) followed by a bottle (for a breastfeeding Mom, this feeding might not be necessary). 10:30 am: Mid morning feeding of a bottle (or breastfeeding). around 10:30. 12:30/1 pm: Lunch (solids first) followed by bottle/breastfeeding after. 4:30/5 pm: Dinner (solids first) followed by bottle/breastfeeding. 7/7:30 pm: Evening liquid feed and down for the night. Ellery really just in the past several week has understood her ability to pick up food and feed herself. I can tell it makes her more excited to eat when she can feed herself. I have been trying to feed her more foods that I know she will be able to pick up and eat but won’t give me a heart attack about choking. 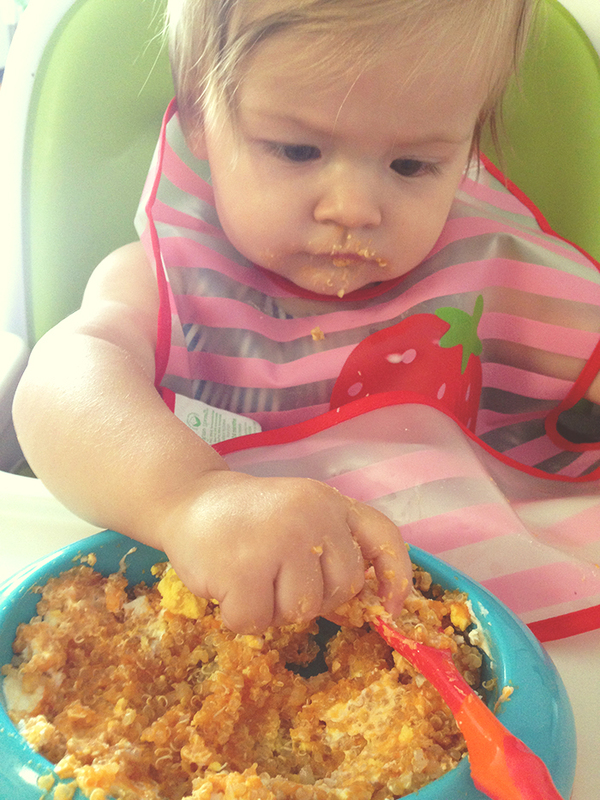 Even the above quinoa dish, she was able to pick up big chunks in the bowl and feed herself. I use the spoon to give her a few bites in between just to make sure she doesn’t get frustrated. -Some sort of veggie/fruit puree I’ve made that week. I have also begun to offer her a cup (either sippy or a small plastic cup) filled with milk (formula or breast milk) so that she gets used to using a cup and drinking with her meal. I can tell she likes having something to drink with her food (don’t we all?!) We are loving the lollacup at the moment for a sippy cup. As a non mom, I was still interested in all this info! Love you elle and your chevron onsie! !